Yum ! Going there right now to see the recipe ! 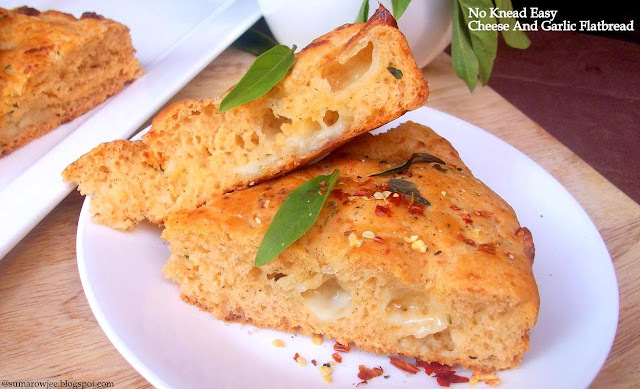 great focaccia...lovely flavours..i usually do mine with garlic,tomatoes and olives...going to try out your version soon..nice! Omg, love those mozzarella chunks in this flatbread, yummy...Fabulous guest post Suma. Great pics of a yummy bread !! Garlic and Cheese, mmmmm... That'll surely smell so good. I love No Knead Bread and Divya's looks delicious. Cheese & garlic...whats not to love. WOW! !